A medium to large (up to 900 mm or 36" in total length) gray, brown, or orange-brown snake with a single cream colored stripe down the midline of the back (dorsal stripe). There are usually two additional thin light stripes on the 2nd and 3rd scale rows of the lower sides (counting up from the belly). Some specimens lack stripes or have very diminished stripes. Alternating dark blotches mark the areas between the stripes. These dark blotches often intrude into the stripes. The underside is light gray or cream, occasionally with flecks of brown or orange. The pupils are round and the dorsal scales are keeled. This snake is found across most of northern and northeastern Arizona. Isolated populations exist in the Sierra Ancha of Gila County and the Pinaleño Mountains of Graham County. In Arizona it occurs at elevations ranging from about 4,800' to over 9,000'. It is found in a wide variety of communities including Great Basin Desertscrub, Plains and Great Basin Grassland, Great Basin Conifer Woodland, Petran Montane Conifer Forest, and Petran Subalpine Conifer Forest. It seems to be most abundant in the vicinity of water such as streams, stock tanks, and lakes but is also found in open forest, meadows, and grasslands far from standing water. 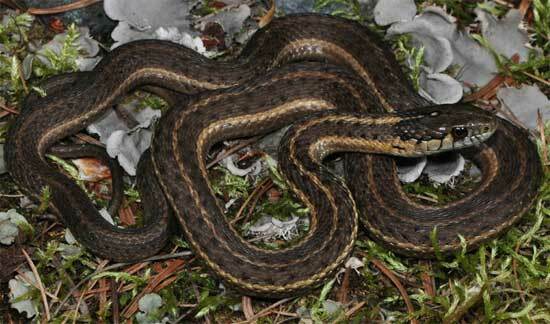 This primarily diurnal snake hibernates during the cold months of late fall and winter. It forages on the ground and in the water for a wide variety of prey items. The Terrestrial Gartersnake feeds on fish, amphibians, lizards, small mammals, birds, insects, snails, worms, snakes, and leeches. Mating takes place in spring and a litter of up to 27 young is born in July, August, or September. WANDERING GARTERSNAKE Thamnophis elegans vagrans. ARIZONA WANDERING GARTERSNAKE Thamnophis elegans arizonae.